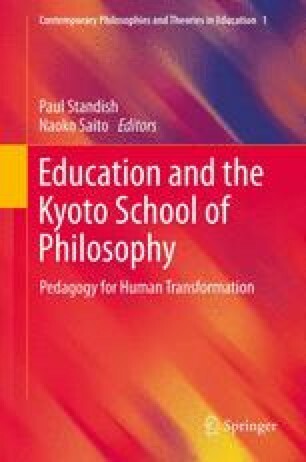 This paper reconsiders the origin of education from two perspectives: one is pure gift giving, that which does not anticipate any return, and the other is found in the sense of indebtedness to the sacrificed (the dead) in a community. In considering these two perspectives, I shall attempt to reexamine post-war pedagogy in Japan. A crucial distinction is made between ‘gift giving as an event’ (pure gift giving) and ‘the story of gift giving’, that is the story of the sense of indebtedness to the dead that exists in a community or society. ‘Gift giving as an event’ brings about an experience of dissolution; the code of community based upon utility is violated and the order of community is disturbed. ‘The story of gift giving’, however, despite the reality of inequality and exploitation, reinforces the sense of solidarity and fraternal love among the members of a nation as a community, and intensifies one’s devotion to the nation state as a historical reality, one that transcends the finite life of an individual. It then sanctifies the order of the nation as a community and motivates education based upon the sense of indebtedness. I shall reconsider (post-war) education and pedagogy that has been based upon the sense of indebtedness to the dead, from the perspective of ‘gift giving as an event’. I will discuss the impossibility and possibility of education as gift giving.